Deep breath. This book is elegant, extraordinarily insightful, and most of all important. Despite the big words and the complicated science, Siddhartha Mukherjee had me riveted from start to finish. I thought I had a knowledge of cancer before this book, but now I understand it more, in all of its feverish complexity and horrifying beauty. 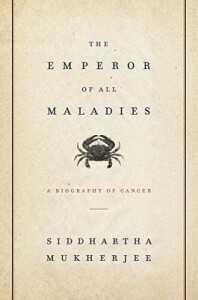 In the history of cancer research, there have been bright flashes of brilliance combined with truths that are stupidly rediscovered centuries too late (such as the carcinogenic nature of tobacco, which was delineated by an amateur scientist in a pamphlet in 1761 but that was still, somehow, up for “debate” in the 1960s). What sticks with me most is that no one in cancer research really knows what they’re doing, but the strength of truly great doctors lies in knowing that instead of assuming the arrogant position that you’ve found the only way and other possibilities are laughable. I did not know that this book won the Pullitzer this year when I read it, but it deserves every piece of praise it gets. I will admit it was very hard to read this book with a loved one so struck by breast cancer. On every page are patients suffering through cancer and its treatments, losing their battle only a few chapters before the particular solution they needed is found. Cancer is a formidable foe that, for better or worse, is tightly intertwined within our genes. One of the doctors profiled in the book had a favorite aphorism about how death in old age is not something to be beaten, but death before old age is the enemy to fight. That is what I hope for. Not extravagant medical “advances” aiming for immortality — just the opportunity for each of us to fully experience our mortality for a period of time that does not rob of our best years, or the chance to have children, or the chance to find love and find ourselves. Sigh.